Jack Dougherty is a Defensive Prospect to Watch · Let's Go Amerks! Jack Dougherty is a defenseman that has quietly been playing a solid game. The word quietly has been used because he’s not making a lot of flashy plays or putting up a lot of points, he’s simply playing a defensive and getting his job done. Through 14 games he has 5 points (1G+4A) and is second on the team with a plus-15, only second behind Lawrence Pilut at plus-19. Standard disclaimer, that stat isn’t definitive but it’s a starting point. His season started with a lower body injury on October 10, his second start, which caused him to miss the next 12 games. Since returning to the lineup on November 17 he’s only been scratched once out of 13 games. That’s partially due to losing defensemen but also because he’s proving his worth. When he was traded to the Sabres in exchange for Nick Baptiste just four days before the start of the regular season he was aware of the depth on defense in the organization. The trade appears to have paid off in terms of adding depth on the blue line. Dougherty was drafted in the second round, 51st overall, by the Nashville Predators in the 2014 draft. Dougherty also played on the U.S. National Under-18 team in 2013/2014 along with another player everyone knows – Jack Eichel. The Sabres organization gained a defensive prospect in exchange for a forward that wasn’t in the immediate plans for the organization in Baptiste. Dougherty has been steady on the blue line. Baptiste just ended a 16 game stretch without a point for the Milwaukee Admirals. At one point there were nine defensemen on the Amerks blue line for practices which meant no guarantee for playing time. In terms of depth charts his name hasn’t been mentioned above Will Borgen but with the way he’s playing he could be moving himself up the chart. Talking with a big smile (that’s missing a tooth) he mentioned how great the locker room is, how well the players are all treated, and that he couldn’t be happier within the organization. That tooth was lost in the game against Wilkes-Barre/Scranton when he was hit with a high stick knocking out half of it. The team dentist had told him he was going to eventually lose it so they just yanked it. 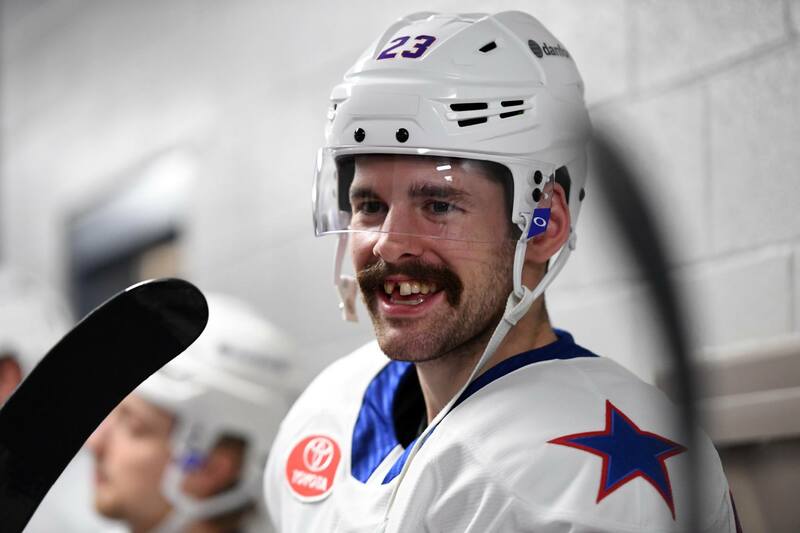 Side note, his mustache has earned praise and many comments from the locker room – some of which can’t be repeated but all said with a laugh. It’s a true throw back.